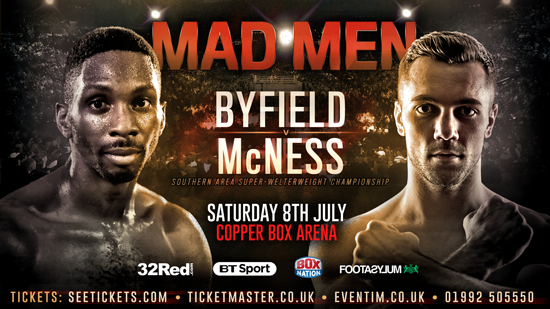 Sam McNess will challenge Reading’s Asinia Byfield for the Southern Area Super-Welterweight strap at the Copper Box Arena on Saturday 8th July, live on BT Sportand BoxNation. The multi-titled former Repton and GB amateur prospect has raced to 7-0 (3 KOs) since turning pro in July 2015 and is delighted to be fighting for his first pro title in just his eighth outing. McNess, a life-long West Ham fan, already has a strong ‘Hammers’ following and hopes to emulate fellow West Ham fanatic Kevin Mitchell by boxing at the home of his beloved team one day. “To be challenging for my first professional title just around the corner from West Ham’s ground is great,” said McNess. “I’ve had a little look as Byfield and I don’t think he is in anywhere near my league and I’ll show that on July 8. “He seems to have a lot to say for himself but I like to do all of my talking in the ring. Hopefully he can back up all of his talk on July 8 because he is going to look very stupid otherwise. It will be interesting seeing how he handles hundreds of mad West Ham fans. Byfield, 27, beat Erick Ochieng to win the Southern Arena belt in October last year before making a successful defence of his title against John Brennan in February. Managed by Mickey Helliet, Byfield holds a record of 12-1 (4 KOs) with his sole loss coming against Arthur Hermann in April 2016. “This fight is way too early for Sam,” said Byfield. “He definitely shouldn’t be fighting me, he could have waited and picked his opponents a little better. Sam has a good amateur background but he is going to be inexperienced at ten rounds. He is a good basic boxer but I think he is punching above his weight with me.